mmmmm, i believe you on the do-over status! this looks yummy. FGD: There's a very generous portion of delicious dressing in a ramekin in the upper left corner of the photo. You can drown your salad to your heart's content. I don't do well with sharing if it's one of my favorites. I only share at new places to try lots of things. thanks for sharing! Never knew about Yashima. 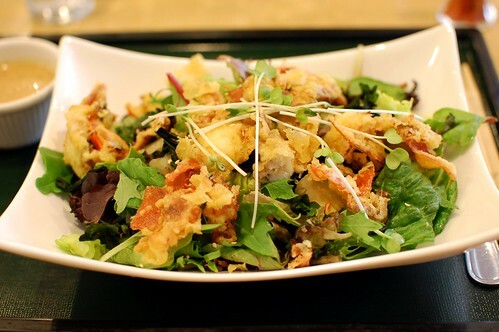 I just can't get enough of soft shell crab, its everywhere now but apaprently going out of season soon. Better get my fill now! Assume the dressing is good too? i haven't been to yashima in a few years since they changed chefs/owners, but i used to really like their tofu salad and sometimes their udon/soba... good to know that something is still good there.